The Great-tailed Grackle (Quiscalus mexicanus, Quiscale à longue queue) is the Phoenix, Arizona version of Calgary’s Black-billed Magpie. They are common in residential areas and commercial areas with food garbage; both are long-tailed omnivores of a similar size; and they make loud, often harsh, sounds. Great-tailed Grackles are non-migratory and mostly live in the southwestern US, Mexico and Central America. I met them when J and I went to visit his folks in Mesa this past December. My first Arizona bird photo! J and I were waiting for our tasty breakfast at the Essence Bakery Café in Tempe when I saw this grackle on the lawn outside the café. So I sneaked outside with my camera for a few quick snaps. 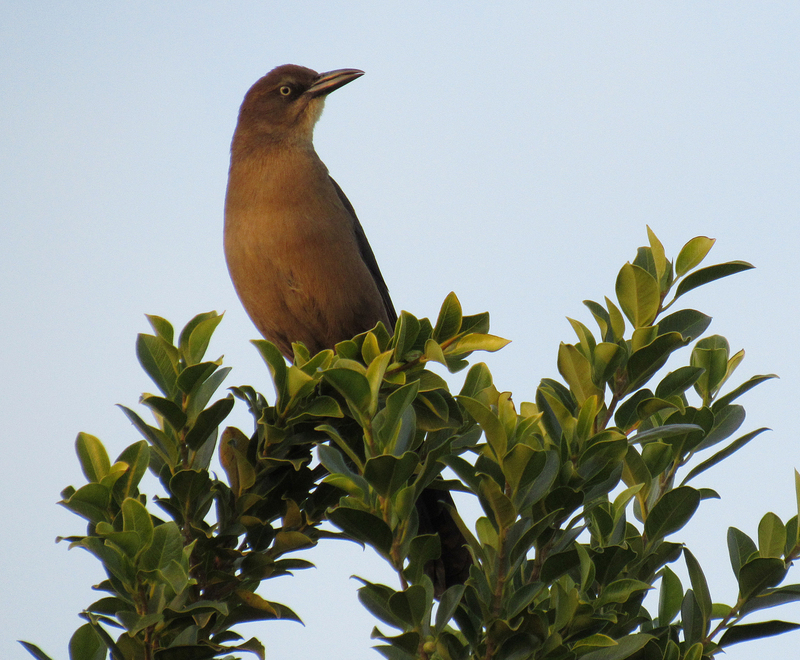 A female Great-tailed Grackle. Half the size of a male and a different colour! 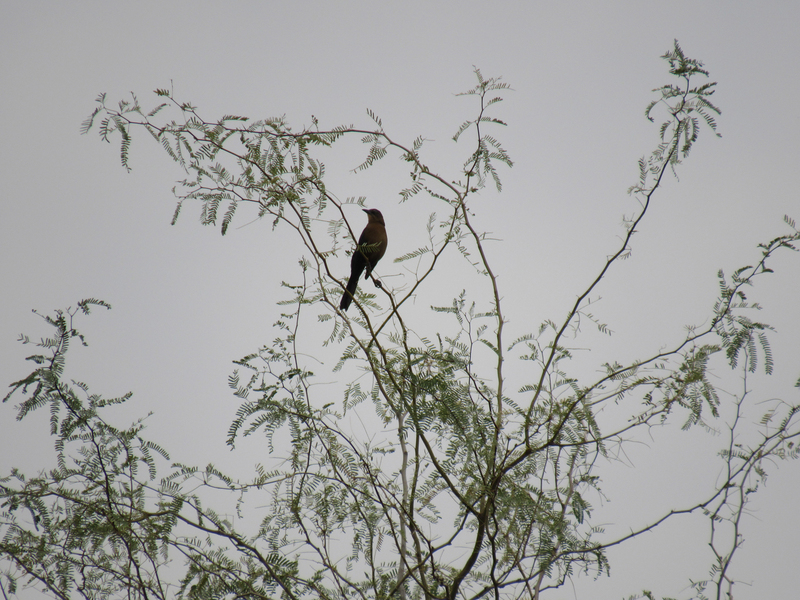 I saw this gal in a lovely Palo Verde tree while waiting in line at the McDonald’s drive-thru. J, his parents and I went to check out the Gilbert Water Ranch on a Saturday afternoon. An amazing place to go birding in the middle of suburbia! It started as water-treatment ponds in 1986 but in 1999, the Town of Gilbert decided to create a Riparian Preserve on part of the land. By that time, the birds had already found the water and the birders were already watching the birds. The variety and quantity of birds is astounding and the trails and plants are beautiful too. 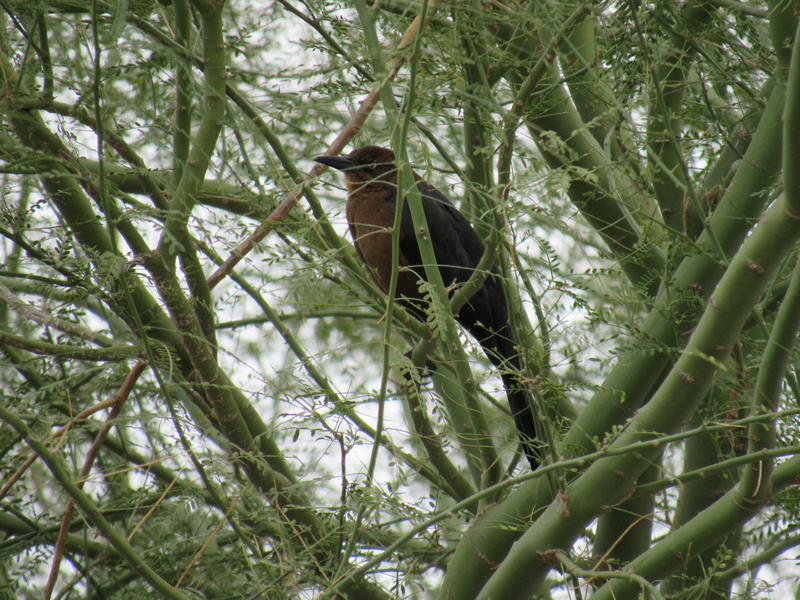 One of the birds and one of the plants I saw: a female Great-tailed Grackle in a mesquite tree. 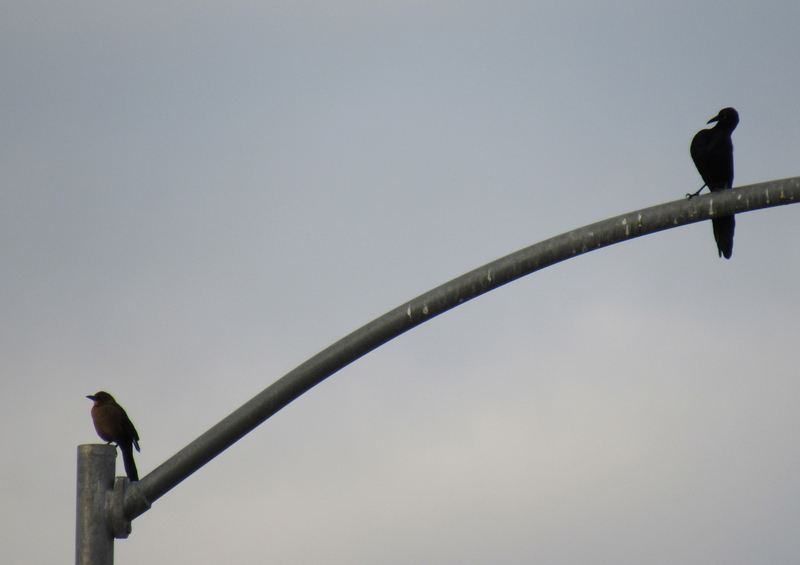 A male and female on a Mesa street light – Sunday morning from my in-laws’ driveway. Because female Great-tailed Grackles are smaller than males, they need less food and therefore survive in greater numbers than males (allaboutbirds). 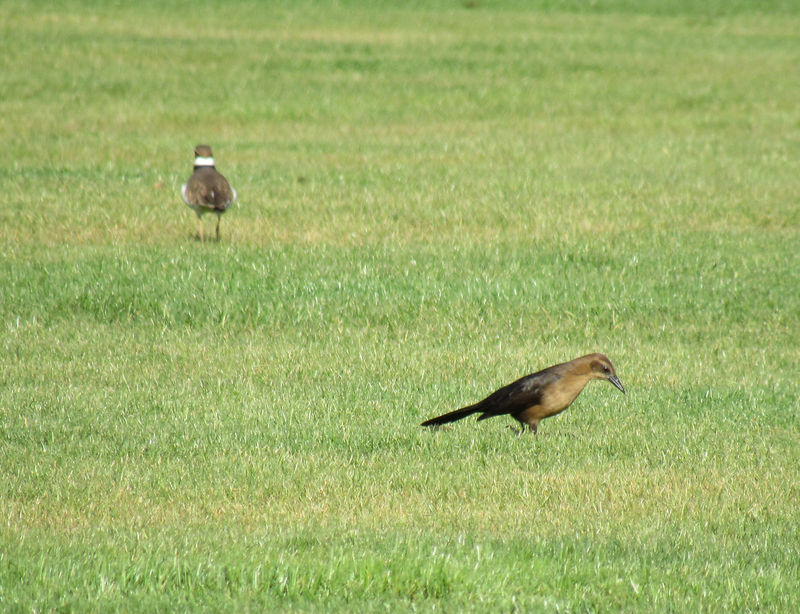 A female Great-tailed Grackle on the lawn of a neighbourhood park in Mesa. Killdeer and Mourning Doves were also pecking at the lawn (killdeer in the background). Male on a Mesa rooftop. 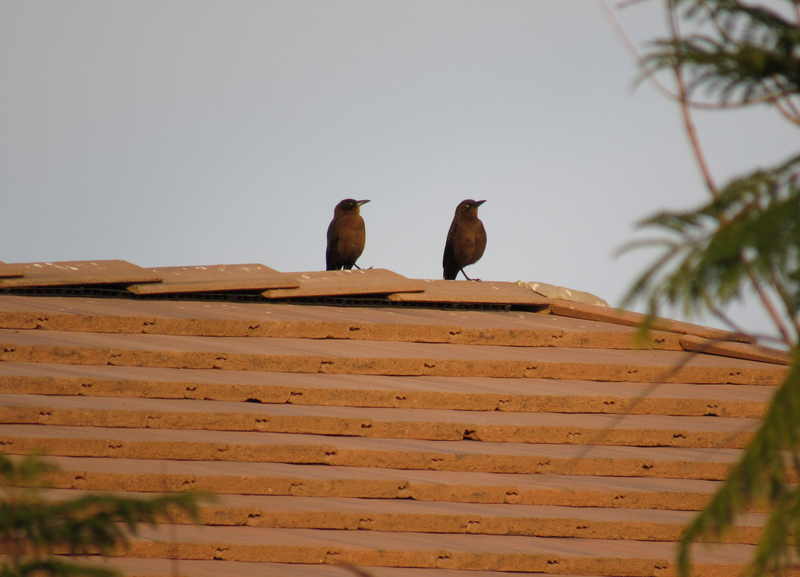 Two females on a Mesa rooftop. I thought this was an orange or lemon tree but the fruits aren’t lemons or oranges. If you want to try to identify this tree, please see the next image for a somewhat better view of the fruit. 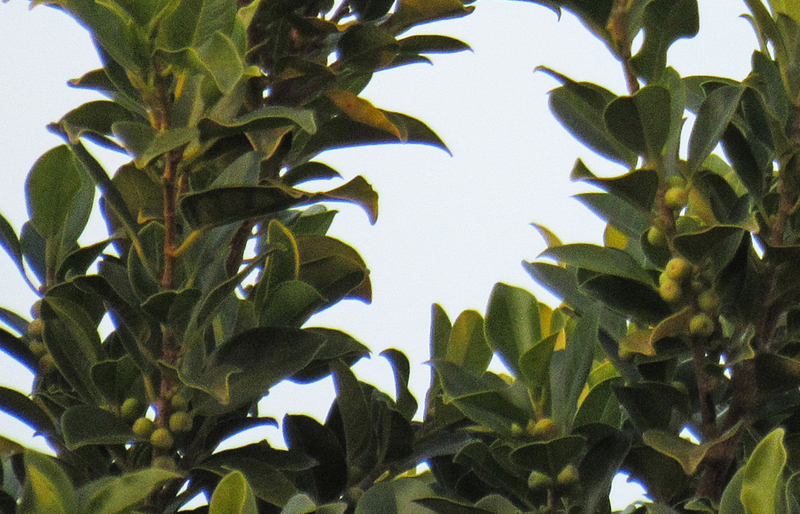 There is one wee fruit in the bottom-centre of this photo. Do these fruits look familiar? 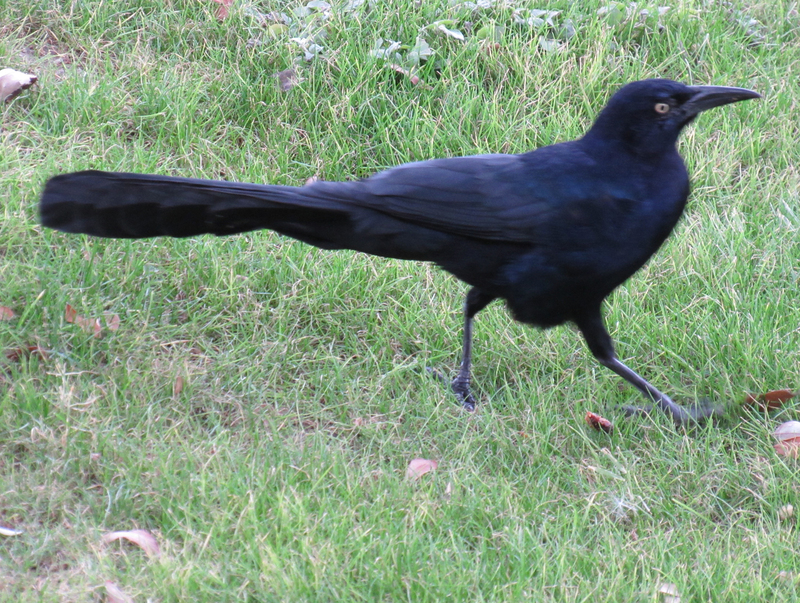 I love all grackles– great-tailed, boat-tailed, etc.! They’re so handsome and fun to watch! Glad you got to see so many. Yay! Grackle love! The Great-tailed is the only grackle I’ve met so far. With the male and female looking so different though, it felt like I met two. I definitely enjoyed hearing and seeing them around. Oh fun! A bird ID 36 years later :-)! I’m surprised you remember them. I wonder if my parents remember them? I was 3 or 4 when we lived in Guatemala in the early 80s so I don’t remember much. Were your parents missionaries or hippies/gringo travelers? ;-D I went there to go to language school – loved the people there. Language school in Guatemala sounds like a cool experience :-). My dad is a civil engineer. My mom remembers the grackles from when we lived in Costa Rica a year earlier. She says they would come on our lawn and we would throw them some seeds from the second floor balcony after my afternoon nap. A handful of cows, belonging to a nearby farmer, would also come to graze on our lawn. Lovely images. 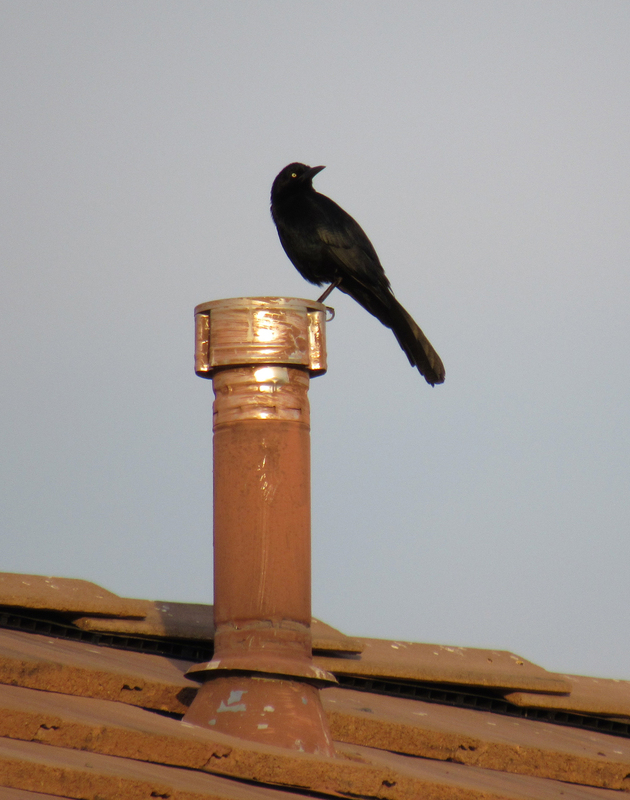 I see the Grackle in Las Vegas NV where I live. Thanks for the name. Thanks Sharon :-). Glad I could give some of your feathered neighbors a name. Ah! You’ve met the Phoenix grackles :-). Their shiny feathers are quite lovely. Grackles! Happy New Year, Myriam!! Though lots of people think of Grackles as pests, their craftiness and iridescent feathers are really cool. A nice choice for ending the year! 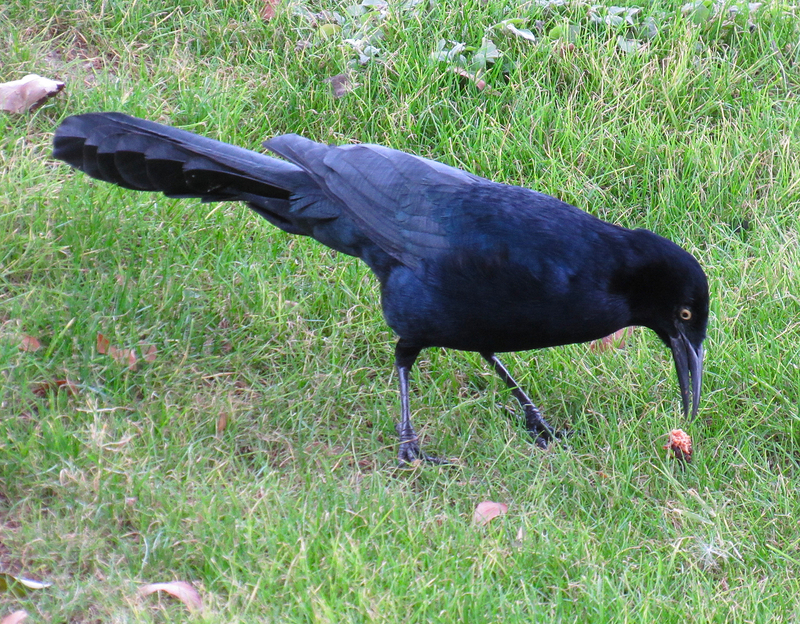 I think the great-tailed grackle is so cool. The first one I ever saw was up close in an urban parking lot in Phoenix, and I whenever I’m in the southwest I am thrilled to see them. Thanks for this great post, wonderful photos. Thanks Jet :-). I’m so glad my photos brought back good memories. I was thrilled to see them when we drove from the airport and I scanned the world outside for bird life. That is an impressive tail! Here in Illinois we have boat-tailed grackles. Much the same, only with slightly less impressive tails. They are remarkably aggressive birds. They used to dive-bomb my poor cat, and they will dive-bomb people as well. Still, they are handsome, aren’t they? Oo, boat-tails! I have not seen one yet. A few years ago, back when I lived in Vancouver and would go running a few days a week, I noticed that the crows would bomb-dive me repeatedly and chase me for blocks, while squawking super loudly, whenever I put metal barrettes in my hair. It was a bit terrifying until I thought about taking them off. Here, the magpies occasionally bomb-dive cats, squirrels and dogs. I think it is a mixture of fun and showing off their flying powers. I like going outside and seeing crows or magpies or grackles going about their city bird life. Wow~I’ve never seen crows do that but of course, they would want the shiny barrettes ! I think you are right, they are enjoying their powers. What a happy thought. Between you and me, I love starlings. I like their plumage, and how they “talk” companionably. Most of all I love to watch their flocks swoop about together without crashing.